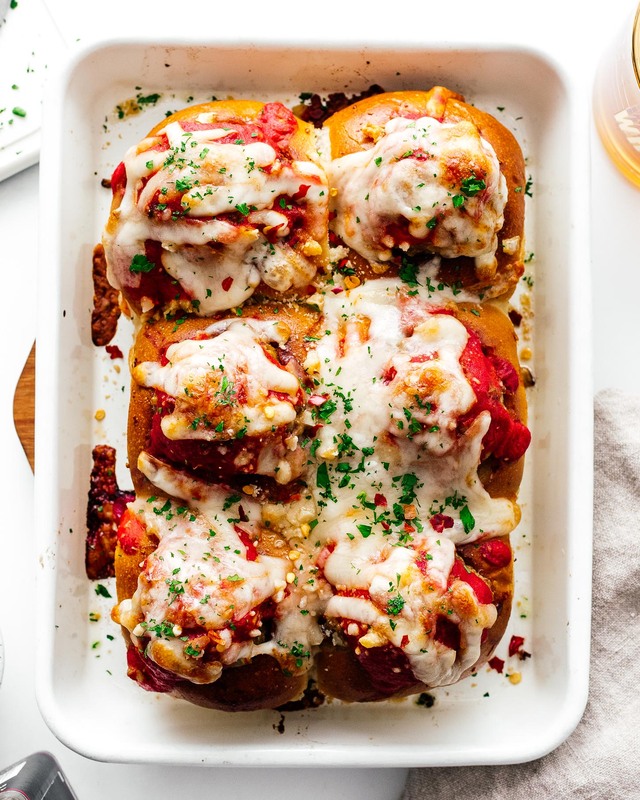 Say hello to your new favorite Super Bowl Sunday snack: the meatball stuffed pull apart garlic bread slider. 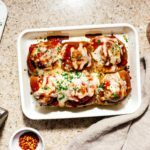 This pull apart meatball garlic bread sliders recipe is the perfect easy comfort-food for tailgating/the Super Bowl, parties or events, or an after-work/school snack that everyone will love. Mike and I first saw these on the Chef John (from Food Wishes dot com) youtube and I immediately wanted to make them. 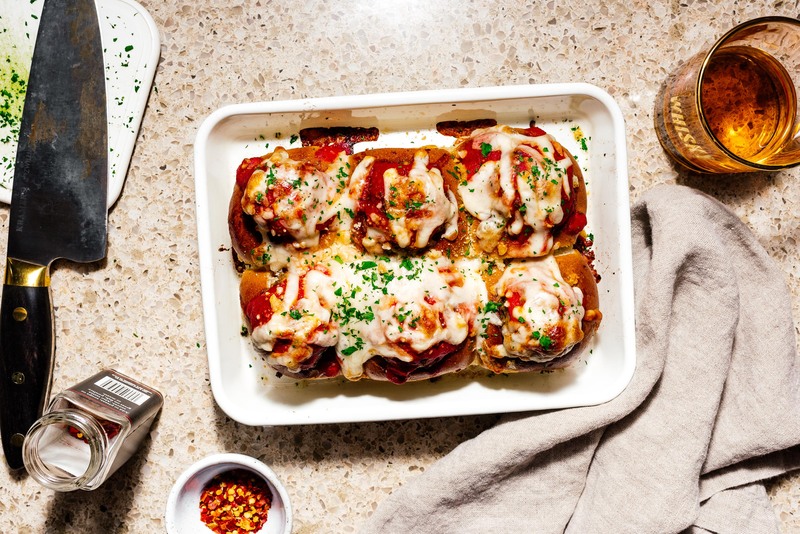 I mean…c’mon, it’s a meatball stuffed into a garlic bread roll! 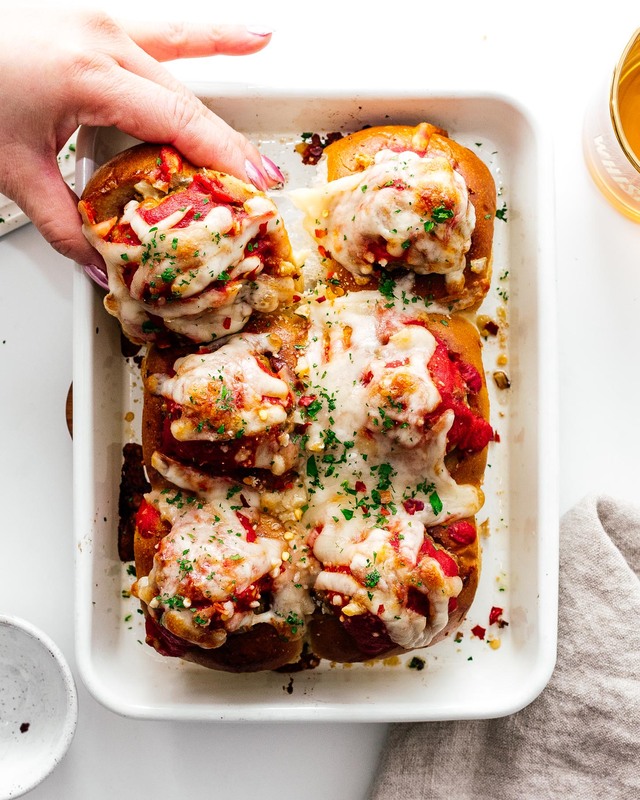 In pull-apart format! It called to me. It haunted my thoughts. I was determined to make them. I would go to the grocery store and longingly look at the tray buns. It got to the point that I knew which day the tray buns would come out looking perfect and golden and which days they would be a shade too brown on top. I’m pretty sure there’s an A-team baker and a B-team baker. Anyway, I got the A-team tray buns and finally made them! And they were just as wonderful as I thought they would be. I went ahead and made my own meatballs but these would be awesome with store bought too. Ease is the name of the game here, which is why you should definitely just use store bought or leftover tomato sauce. These guys are cheesy, meaty, garlic-y, and SO GOOD. Make them guys. You need them in your life. Note: The tray buns I found came in 6s, but if you can find 8 that’s how many meatballs this recipe will make. 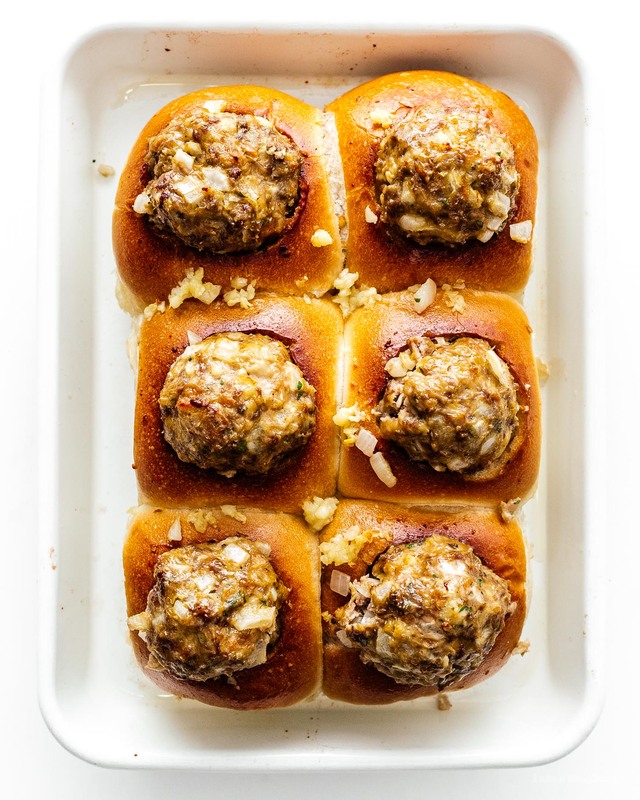 If you can only find rolls with 6, you get 2 bonus meatballs for snacking on! Leaving the rolls attached, cut a hole into the top of each roll, about 2/3 of the way down. Soak the parts of the rolls you cut out into a large bowl with the milk. After 1-2 minutes the bread should be soggy and wet. Using your hands, squeeze out as much milk as possible. Discard the milk and use your fingertips to break up the bread into very small breadcrumbs. Add the ground meats, chopped onion, 1/2 tablespoon chopped parsley, 1 clove crushed garlic, egg, salt and pepper to the bowl with the bread. Mix everything so that it’s homogenous, but loose – don’t work the meatball mixture too much. Divide the meatball mixture into 8 balls and roll – you’ll get two extra. Place on a foil lined rimmed baking sheet and bake until just cooked through, about 15-20 minutes. While the meatballs are baking, make the garlic butter: melt the butter in a small saucepan and stir in the remaining 2 cloves of garlic. Set aside. 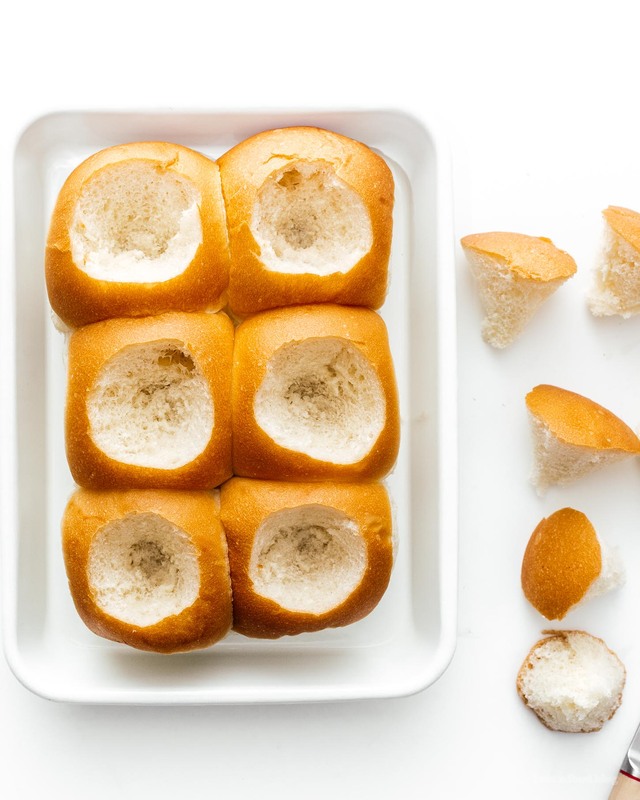 Place the tray buns on a baking sheet and brush with the garlic butter on the insides and outsides of the rolls. By now the meatballs should be done, take them out and place the tray buns in the oven and bake until golden, about 5-8 minutes. Remove from the oven and put in about 1 tablespoon of tomato sauce into each hole. 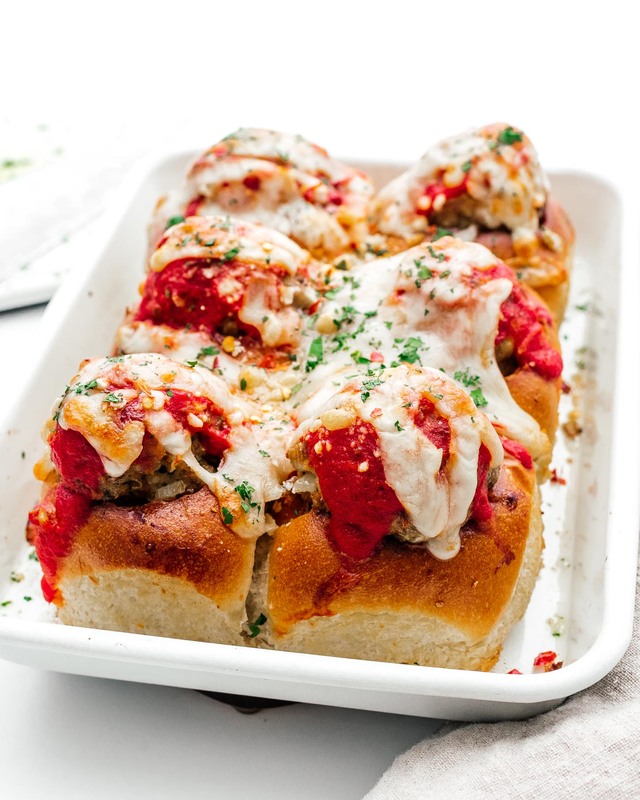 Stuff a meatball into each hole and top with a spoonful of tomato sauce and sprinkle of mozzarella cheese. Finish with a sprinkle of parmesan. Bake until the cheese is melted, 12-15 minutes. Sprinkle on the parsley, let cool slightly and enjoy! very impressive, not your ordinary dry sandwich, or even hot sandwich, perfect for the game, thank you!